This tutorial is intended to get you up and running to the point of being able to turn an LED on and off over wi-fi without needing an Arduino wi-fi or BlueTooth shield. The purpose of using the phone is to give your project wireless capabilities, a camera, mic, screen, speaker, and all of the other capabilities in your $400 cell phone. 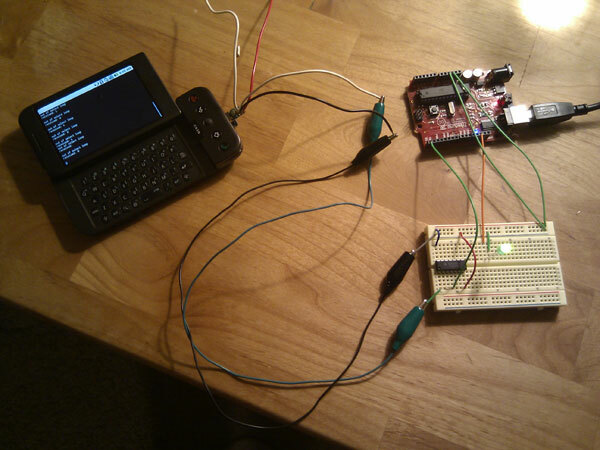 Connecting the G1 to an Arduino helps the phone connect with the outside world with locomotion and other inputs. Together, the G1 and Arduino allow you to use inexpensive electronics such as simple servos and sensors, to build powerful devices such as robots, remote telepresence, or fun toys for kids.